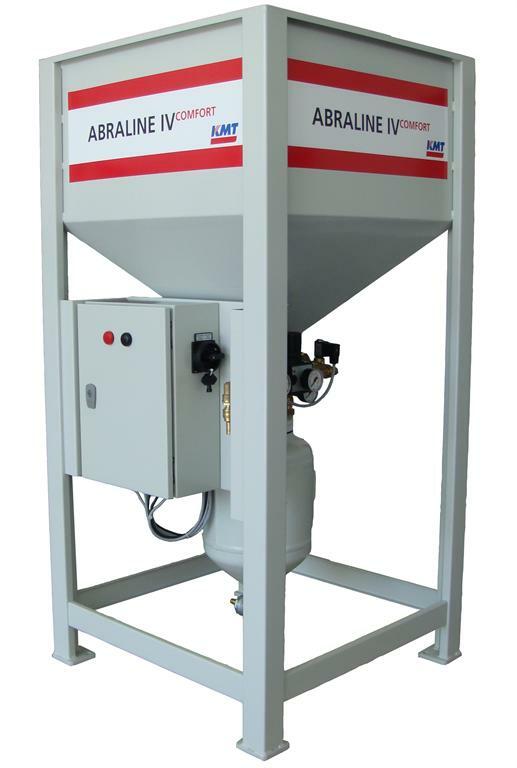 For many years now, KMT Waterjet has been offering the abrasive bulk transfer system ABRALINE. After the successful introduction of the high performance version of this system – the model ABRALINE IV Advanced – KMT now presents an enhanced model of the smaller version – the model ABRALINE IV Comfort. This product features the same high quality design as its bigger sibling thus being suited as a cost-saving alternative for those machine operators, whose waterjet cutting machines do not run continuously. When cutting with a waterjet, the exact monitoring of all relevant parameters is the precondition for the efficient and reliable operation of the complete system. To make this easier, KMT has developed the abrasive bulk transfer system ABRALINE which ensures the proper abrasive flow to the cutting heads at any time. Therefore, machine operators using the ABRALINE can avoid quality issues with the cut results and save time and costs. The newly developed model ABRALINE IV Comfort has some advantages compared to its predecessor – the ABRALINE III. All key components are manufactured in Germany and feature a high level of quality. From the robust frame with proper bends and weldings, to the reliable electronics assembly, to the pressure vessel, which has been designed following the requirements of the pressure equipment directive, every component has been constructed to provide a long product life and easy usability. Especially the pneumatic pinch valve connecting the abrasive silo and the pressure vessel constitutes an improvement compared to the cone seal used in the previous model. As with the bigger model ABRALINE IV Advanced, the pinch valve ensures long lifetimes even at continuous operation. It is characterized by a free production flow, minimum friction resistance and the absence of leaks and clogging. The two ABRALINE IV models are aimed at different customer groups: The bigger model “Advanced” with its silo volume of 1,000 kg is optimal for cutting machines running continuously and with multiple cutting heads. The smaller model “Comfort” is the cost-saving entry level product for ensuring the abrasive feed for occasional cutting needs. A reliable waterjet cutting machine often is an important factor in determining the success of a company. For machine operators to be able to ensure a smooth production flow and the necessary production safety, they should pay attention to deploying qualified personnel and to using high-quality spare parts. Customers of KMT Waterjet and its licensed partners can count on reliable support when implementing the necessary preconditions by using KMT Genuine Spare Parts and the comprehensive customer service of the company. KMT Waterjet has a large amount of immediately available spare and wear parts in stock. If need be, these parts can be delivered within 24 hours. Moreover, the company offers a 24-hour service hotline. All components have been designed for optimized interaction and are manufactured at the company’s ISO-certified production site. This results in precisely dimensioned spare parts which can be easily installed and which are very reliable even at demanding conditions. With using KMT Genuine Parts, customers can further benefit from the KMT warranty conditions. If the machine has a CE Declaration of Conformity, the conformity remains intact thus ensuring that the safety requirements of the EC machinery directive are still met after the repair. When using spare parts by other manufacturers, both the warranty and the CE conformity become void. In emergencies, KMT customers can contact a KMT technician 24/7 via the company’s service hotline ensuring quick support and reduced downtimes. KMT offers comprehensive training courses educating the customers’ employees to become capable machine operators. Moreover, also the KMT technicians attend trainings on a regular basis to keep them up-to-date concerning new product developments and to keep them ahead compared to other service providers. KMT maintains a global network of service offices. Therefore, the next service technician never is far away and may very possibly be contacted in the customer’s native tongue.